The ISU Theatre CoLab Initiative seeks to foster collaboration and engagement between ISU Theatre and other groups both within ISU’s campus and throughout the broader community to create citizen artistry, inspire and be inspired by meaningful public discourse and expand opportunities for ISU students, faculty and staff. The CoLab Initiative is made possible in part by the Transforming Liberal Arts and Sciences Endowment. Get Out the Vote - ISU Theatre partnered with the Playwrights Horizons' #Play Our Part initiative and the non-partisan ISU student organization Vote Everywhere to Get Out the Vote in 2018. Monday Monologues - ISU Theatre is a regular contributor to the Monday Monologues Series at Parks Library. Salisbury House and Gardens - ISU Theatre regularly presents scenes and songs from their productions as special events at Salisbury House and Gardens in Des Moines. Campanile Project - Theatre students and faculty are working with Music, Engineering, and Design students and faculty on creating a 1:5 scale replica of ISU's Campanile/Carillon that is accessible, functional, and portable. 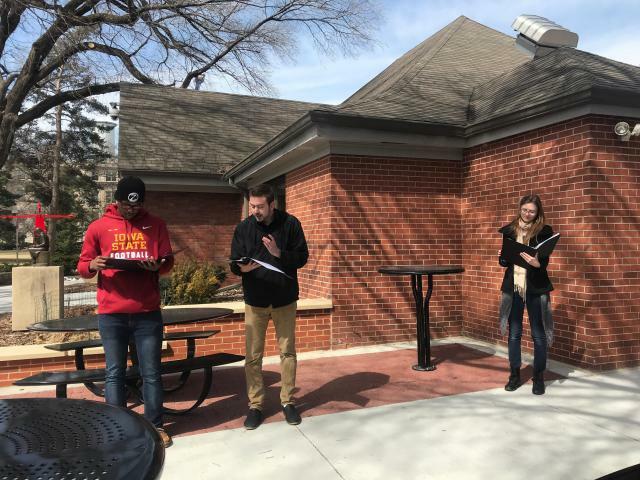 Office of Diversity and Inclusion - Partner with the ISU Theatre production: Iowa Odyssey, 2019. Does your organization wish to partner with ISU Theatre as a part of the CoLab Initiative?